We are very pleased to welcome you at the Makassar Lounge for our second official March event. 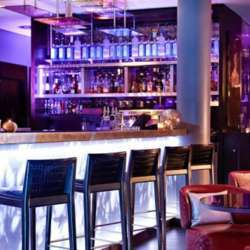 This amazing Indonesian lounge bar is nestled in the 5-star Renaissance Hotel (Marriott group), a few steps from the Arc de Triomphe (Etoile). The bar will be privatized for us the whole evening so do not hesitate to attend at any time, even late! The entrance fee includes one drink (home made cocktail or glass of wine or beer or soft drink) plus 3 tapas per person (blini saumon, croque monsieur & choux farcis pistache). This is a wonderful occasion to mingle and meet new friends and/or establish business connections! To get there take the metro to: Etoile (metro line 1 or Rer A) or Ternes (metro line 2).